Why become a Padi Pro?Why Koh Lanta, Thailand?Why with Lisa?What are the options? Why change your lifestyle and become a Padi Divemaster or a Padi Dive instructor? Do you love diving ? Do you find your current job stressful ? Or maybe you just finished your study and would like to travel the world ? Would you like to live in a warmer country ? How about guiding divers under water and showing them the awesome under water world, filled with beautiful fish and corals. Or maybe you would like to go all the way: learn to become a Padi dive instructor and teach diving students how to dive. If you would like to dive different places in the world, make a living with teaching diving or guiding divers, we can help you ! Why start your diving career (Padi Go Pro) on Koh Lanta in Thailand? When divers from Andaman Dive Adventure Lanta are diving around Koh Lanta they will see beautiful corals and many different fish (divers also see some turtles, sharks (not dangerous ones)and macro life like sea horses & ghost pipe fish). In high season a diver might see a whale shark or a manta. All ADA’s Padi dive instructors and Padi Divemasters love diving so much around Lanta, that we made Koh Lanta our home. Koh Lanta is Thailands 4rd biggest island, located in the south of Thailand in the Andaman Sea. 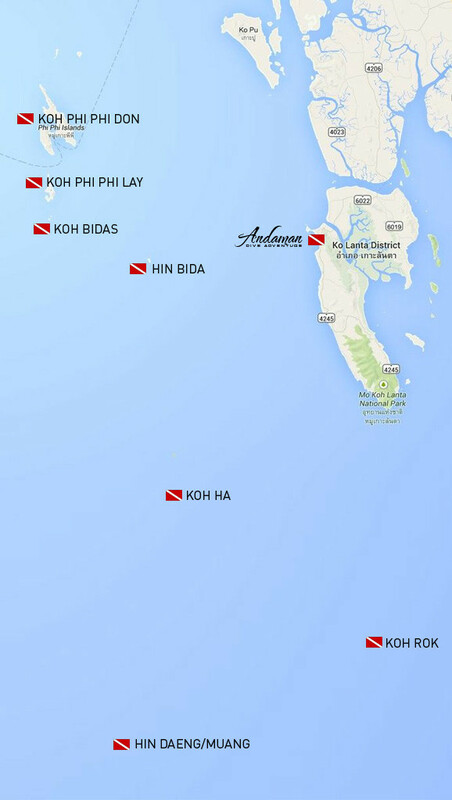 With a location just below Koh Phi Phi, just above Hin Daeng and Hin Muang and just next to Koh Ha, divers will have about 30 dive sites in direct reach. Koh Lanta is easy to access from Phuket, Krabi and Trang (airplanes from Bangkok, Kuala Lumpur, Singapore and Hong Kong). There are many different resorts on Koh Lanta, ATMs, banks, 7/11s and many different beautiful beaches and restaurants. Easiest way to get around on Lanta would be a tuktuk, rent a motorbike,car or bicycle or to take a taxi. Most beautiful beaches with cosy sunset bars and beautiful sunsets are Klong Dao and Pra Ae (or Longbeach). In the restaurants you can eat Thai and foreign food, we also have elephant trekking, waterfalls, island trips, Thai cooking courses, a gym, Thai boxing courses and fights and Thai language courses on the island. It is not a party island yet. Great diving for your Padi Internship course & great living on the Island, make for great diving courses and an all around great dive experience ! Why start your diving career (Padi Go Pro) on Lanta with Padi Course Director Lisa? Padi Course Director Lisa Bier has been working in diving since 2002 and has guided and taught scuba divers in a lot of different countries, like Thailand, Malaysia, Caribbean and Mediteranne. She has a lot of experience teaching students from different countries and different cultures and speaks many different languages. She also owns a dive center and has owned another dive center before this one. Allow Lisa and her experienced diving staff to teach you how to teach students to dive and how to guide experienced divers. All diving courses are taught according to PADI standards for safe diving and get certified with a Padi diving certification. Please click here for more information…. What are the different Padi Go Pro levels? Wether you have never dived before (Zero to Hero program) or you are an experienced scuba diver already, we have the perfect fitting Padi Internship for you. Inform us about your diving qualifications and we will fitt the program to your diving experience. Inform us about the time you have to do your Padi Go Pro diving courses and we will schedule it around your holiday time. You can become a Padi Divemaster, Padi Instructor, a Padi Specialty Instructor or even a Padi MSDT (Master Scuba Diver Trainer) Instructor. The sky is the limit. Have a look at the Padi Internship programs. When to dive on Koh Lanta? Best period of the year for diving (if you have a choice) around Koh Lanta is between the 15th of October and the 20th of December and from the 20th of February until the end of April, because it is not so hot here then (oke, we do sometimes get a short rain shower and a little wind) and the island is not as busy as it is around Christmas and New Year. The holiday periods in Europe is a more expensive period, because the island is very fully booked around this time of the year.Best chances for manta’s and whale sharks, while diving is from November until end of March. The Andaman Sea side of Thailand has rainy season from May until the end of September. This means that it could be fairly wet here then, very quiet, not many diving trips and not many restaurants and resorts are open on Koh Lanta. 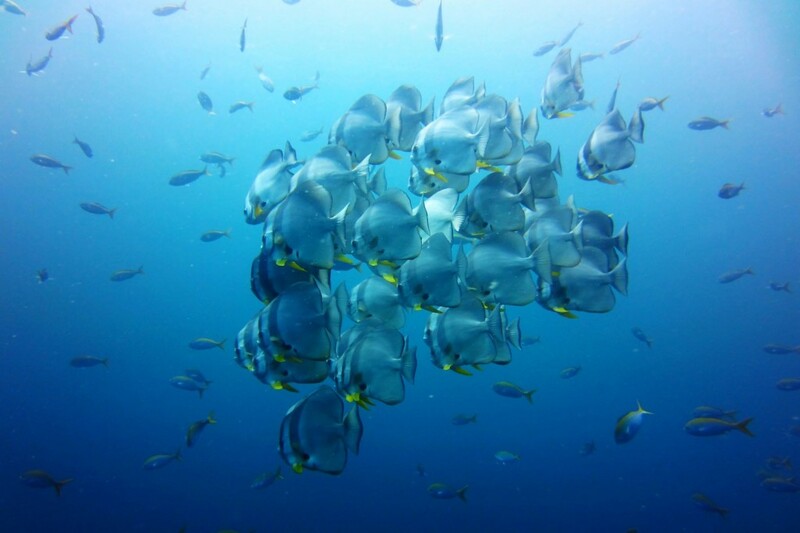 Koh Lanta’s marine park (Koh Ha, Hin Daeng and Koh Rok) is also closed for diving and snorkeling from the 15th of May until the 15th of October. How to find us in Thailand? It is closest by to stay on Klong Dao beach or Pra Ae (Longbeach)and those are the nicest areas to stay on Koh Lanta, anyways. We are located in Lanta Island Resort and can book you into this and other resorts of our friends. Become one of our friends on Facebook or Twitter and tell all your friends how great your diving was on Koh Lanta with Andaman Dive Adventure. Keep an online logbook, find the fish names you were looking for online and make new diving buddies online, with Scuba Earth and find ADA on Scuba Earth as well. You can even have an online Padi manual or do your dive theory of your diving course online with Padi’s Elearning. When you get certified you can ask for an Ecard, to show to all your friends you are a diver now. Travel light & keep your memories somewhere safe. For Padi open water diver students or starting divers Koh Ha, Koh Bidas and Koh Phi Phi are the best dive sites to dive, because of their easier dive conditions (currents, tides, depth and visibility). These dive sites are though also interesting for more experienced divers. At every diving depth you can encounter different fish life. Koh Ha is very good for macro photography, but also has the most frequent whale shark encounters, beautiful soft corals, the Cathedral Cavern and best visibility. Koh Bidas and Koh Phi Phi has best chances to see leopard sharks and black tip sharks, beautiful gorgonian sea fans and has bigger schools of fish, but less visibility and more divers. Hin Daeng and Hin Muang have the best chances to see manta’s, have big schools of fish, amazing soft corals and dive depth. Anemone Reef and Shark Point have beautiful soft corals and anemone’s, leopard sharks and macro opportunities. Turtles are easiest to see around Koh Ha, Koh Bidas, Koh Phi Phi and Koh Rok.